~In a medium sized pot, bring vinegar, water, salt, peppercorn, and chili flakes to a boil. 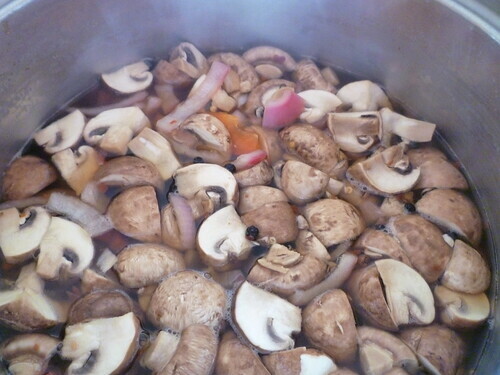 ~Add the mushrooms, onions, and peppers, then return to a boil. Simmer 5 minutes. Ladle vegetables into warm jars and fill with brine leaving 1/4 inch headspace. When the vegetables are in the pot, they take up a lot of space and you are going to think I made a mistake and you need more jars. 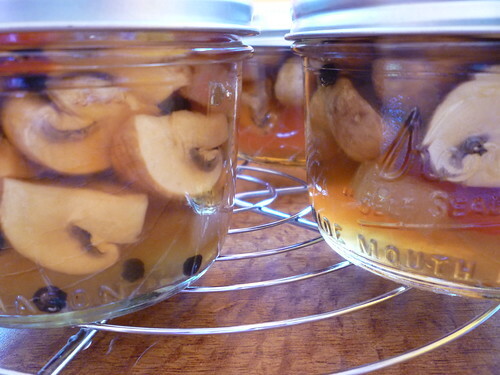 Once the mushrooms are in the jar, give them a little press using the back of a wooden spoon. They are going to compress considerably and each jar is going to hold more much that you imagined. I may just have to try this, next week I think. I've never ever heard of pickled mushrooms before, but at the same time, I've never met a mushroom that I didn't like. I’m going to have to give these a try! It's appropriate time to make some plans for the future and it is time to be happy. I have read this post and if I could I desire to suggest you some interesting things or tips. Perhaps you could write next articles referring to this article. I desire to read even more things about it! Appreciating the time and energy you put into your blog and in depth information you present. It's awesome to come across a blog every once in a while that isn't the same outdated rehashed information. Fantastic read! I've bookmarked your site and I'm adding your RSS feeds to my Google account.